Who is killing witnesses against Colombia's former president? In true mafia fashion, witnesses against Colombia’s former President Alvaro Uribe have become targets in what increasingly appears to be a coordinated effort to eliminate them. One witness has been assassinated and two witnesses have reportedly survived assassination attempts since the Supreme Court ordered the investigation of the former president in February. The latest victim in the apparent persecution of witnesses is the wife of former paramilitary fighter Juan Guillermo Monsalve. Her armored car was intercepted on Thursday in Bogota by two men on a motorbike without license plates. One of the men on the motorcycle got off the vehicle and banged on the car window in an apparent warning. Monsalve, who grew up on one of the Uribe family ranches, is one of the last living witnesses who have testified about Uribe’s alleged responsibility in the formation of the “Bloque Metro” paramilitary group. “Tasmania,” another former paramilitary fighter, was attacked by armed men on Wednesday, a prosecution source told La Nueva Prensa of Gonzalo Guillen, one of Colombia’s most senior journalists. Supreme Court president Jose Luis Barcelo, the magistrate reportedly investigating Uribe, is “scared to death,” according to Guillen, whose safety depends on nine armed guards. Barcelo had ordered increased security for Monsalve, Tasmania and former paramilitary fighter Carlos Enrique Areiza, but to no avail. Areiza was shot dead last month in Bello, a city bordering Medellin, weeks after he was released from prison by prison authority INPEC. Tasmania had also been released from prison in April without the National Protection Unit (UNP) offering him the protection ordered by the court, according to several news outlets. The attacks have spurred rumors that corrupt officials within the INPEC and the UNP could be implicated in the attacks. Both Tasmania and Areiza told the court and journalists that they feared they would be assassinated after their release after having been used to make false statements against investigators. Both men had been coerced into signing blank papers that were later used to falsely accuse Supreme Court investigator Ivan Velasquez and leftist Senator Ivan Cepeda. Tasmania told senior journalist Daniel Coronell that he feared ending up like Francisco Villalba and “101,” two other paramilitary witnesses who were assassinated after their release from prison. Coronell published a cryptic message in a column titled “Life insurance” that was published in weekly Semana on Sunday. According to the journalist, he is holding back the publication of a confession in the hope to save Tasmania’s life. Tasmania told Ignacio, German and me the details of an attack in which he participated. He told us who provided the weapons, in what vehicles they were transported, which businessmen and officers participated in the criminal plan and, above all, who gave the order to commit the crime. The video remains in a safe place and I hope that this column will serve to protect a life. 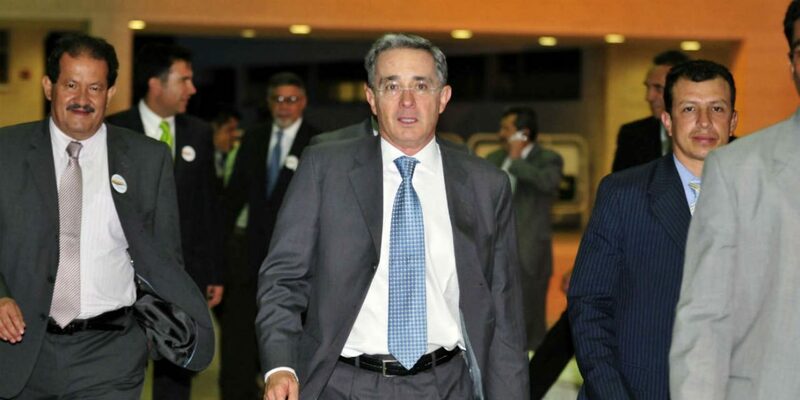 Uribe, a former associate of the Ochoa crime family that formed the now-defunct Medellin Cartel, has been under constant judicial pressure over his alleged ties to the cartel and paramilitary groups that formed in the 1990s. Uribe’s brother is on trial for allegedly leading the 12 Apostles while Uribe’s cousin Mario was convicted for his ties to paramilitary death squads.